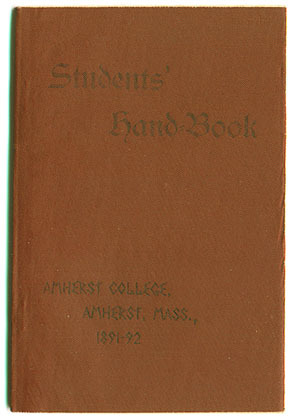 This small booklet, produced by the Amherst YMCA, gives a brief description of the College, athletics, and fraternities, as well as the constitution of the YMCA. It also makes some "Freshmen Pointers," such as "If you want Amherst to win at foot-ball and base-ball, go down to the field, criticize, cheer, and get up geniune enthusiasm. This tells!"